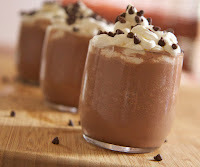 Hot chocolate recipe blended with ice and milk for a cold frothy after dinner dessert. Combine cocoa mix and hot water in small bowl. Place cocoa mixture, milk and ice in blender container; blend until combined. Pour into chilled glasses or small mugs. Serve immediately.